Chris Whiter has been a guitar player for 16 years a guitar teacher for 10 years. He plays many music styles uncluding pop,rock,funk e.c.t. Usually when people ask me on what kind of guitar they should start learning, I tend to suggest acoustic guitars, but if your choice has fallen on electric guitar as your first instrument, then here are my top five electric guitars that i would recommend for every beginner guitar player. 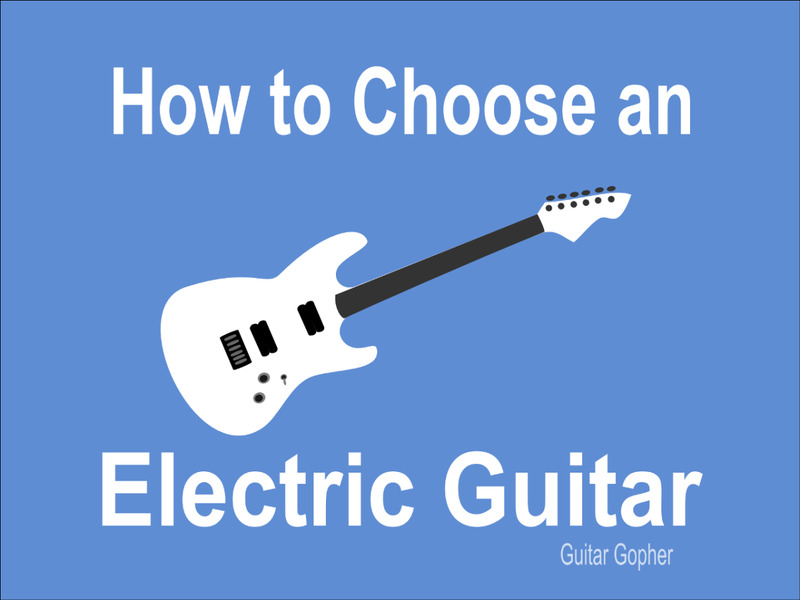 Some words of advice though – when buying an electric guitar you will also need an amplifier and cables to connect your guitar to the amplifier and that will increase the money you will have to spend for all those things. If you’re planning on using amp simulation software like guitar rig, amplitube ir bias fx, you will need an audio interface to connect you guitar to your pc, phone or tablet. Price: Price is of course crucial when picking out your guitar. The price of a good quality electric guitar for a beginner starts at around $150—at around $250-300 dollars, you can get a great starting guitar. I personally wouldn’t suggest going bellow the $100 mark—those guitars are usually badly made and tend to break after a only a couple months of usage. Brand: With guitars, the brands can really speak to the quality of the instrument. Make sure you do your research before you purchase. For example, brands like Epiphone and Squier have strict quality control procedures set in place before their guitars leave the factory. That means that there are lower chances of getting a bad quality instrument than there is with a no-name guitar, even if that means that the price is higher. You get what you pay for. Know what you want: What do you want out of your first guitar? Is it just to practice any general stringed instrument? Or, is it to get really good at a certain genre? If you are into particular music genres, you should check out guitars meant for that kind of music. Some guitars are more versatile than others and can be used for multiple music genres, while there are some others that are designed for a specific genre and won’t sound and play so great when used for other genres. 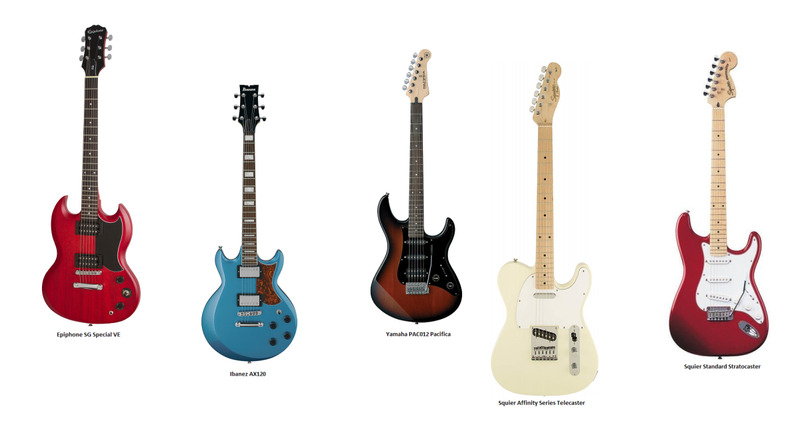 For each of these guitars listed, you'll find my personal commentary, a list of the guitar's general specs/features, and its rating on Amazon. 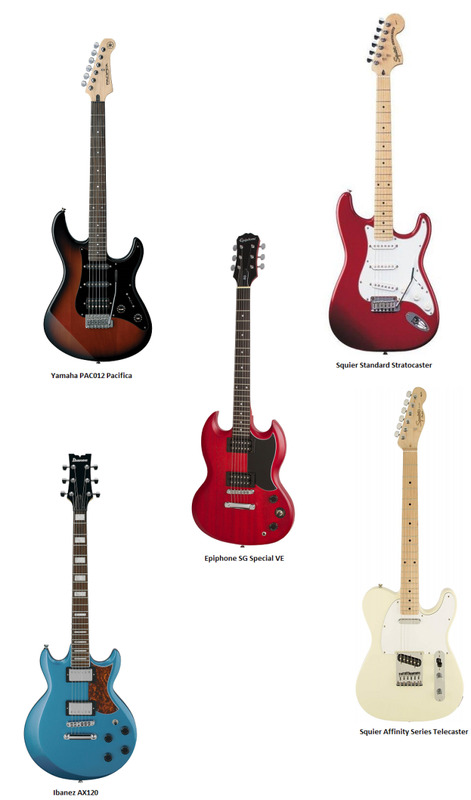 Please let me know if you have any questions or comments about any of the above listed guitars or anything else below. 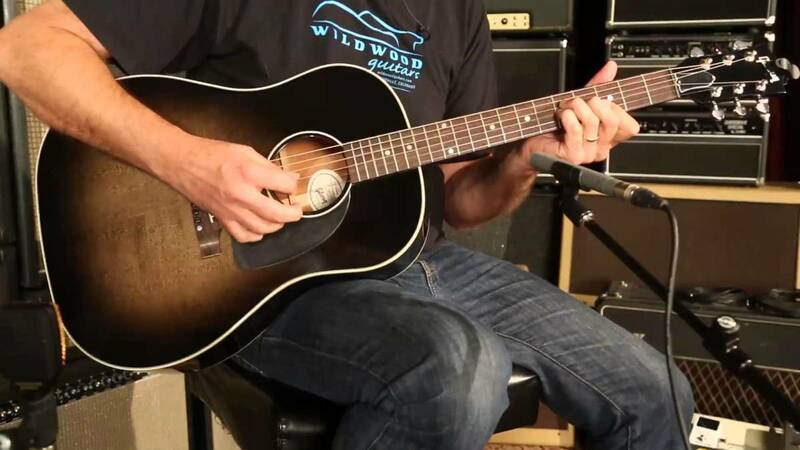 But, first, read about some common guitar terms that you'll need to know in general and to better understand this article. Tremolo bridge: When operated with, a tremolo arm can be used to achieve various sound effects by changing the tension of the strings. This is when the string achieves a "trembling" effect. 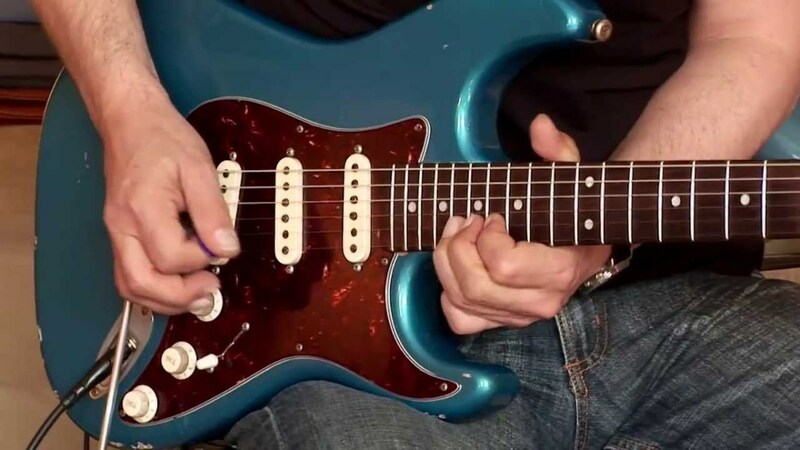 Humbucker: This refers to a type of electric guitar pickup that adopts a method of using two coils to "buck the hum," in other words: to cancel out the interference that is picked up by coil pickups. Recommended for: Pop, Rock, Punk, Blues, Reggae. This electric guitar from Yamaha has been the starting point of guitar learning for many begginer players and I was one of them. The body of this guitar is made out of agathis wood (cheaper alternative to mahogany) and is shaped in stratocaster style. The neck is bolt-on (attached to the body with screws) and is made out of maple with Sonokeling (indian wood similar to rosewood) fretboard. The fretboard has 22 frets. Color: Has three color options – black, metallic dark blue and metallic red. This electric guitar has a vintage tremolo bridge, that works fairly well, but it will detune guitar if used extensively and has six die-cast tuners, that works ok and will keep the tuning stable as long as you don’t overabuse the tremolo bridge. There is also master volume control and master tone control ( controls the amount of treble frequencies). Overall, this is one hell of an electric guitar for beginners and even for more advanced playeys. The hss pickup combination gives this guitar the versatility to cover almost all musical genres. The customers of amazon gives this guitar 4.5 stars out of 5. Recommended for: Pop, Rock, Blues, Country, Reggae. Squier, a subsidiary company of Fender, gives you one of the most purchased electric guitars in the beginner category. The body of this guitar is made out of agathis ( similar to mahogany) wood and is shaped in stratocaster form. The neck of this guitar is bolt-on and is made out of maple and depending from model can have either maple or indian laurel fretboard. The combination of these woods give this guitar warm and well balanced tone woth slight boost in midrange frequencies. 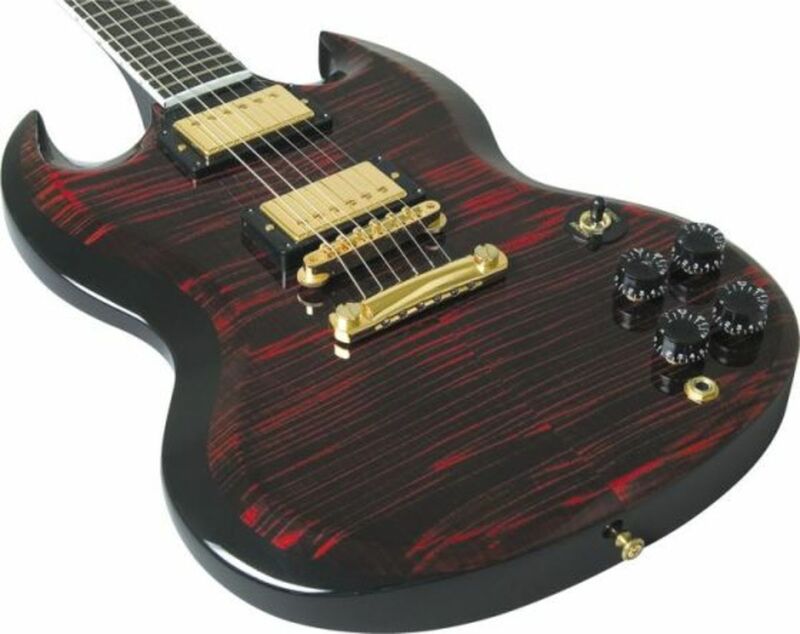 Color: Comes in several colors – black, amber sunburst, antique Burst, candy apple red and cherry sunburst. This guitar has a 2-Point Synchronized Tremolo bar and standard tuning pegs. As with the Yamaha Pacifica, the tremolo bar will work ok if you will not abuse it, otherwise you might have tuning problems. The fretboard has 22 frets. There is one master volume control and two tone controls, one for neck pickup and one for middle pickup. Overall, this electric guitar is one of the top guitars for beginners suitable for most musical genres. Amazon customers have given this guitar a 4.1 stars out of 5. Recommended for: Rock, Metal, Punk, Blues. Epiphone, a subsidiary company owned by Gibson, has a long history of making amazing affordable guitars and have been making cheaper alternatives to Gibson guitar models for decades now. The body of this electric guitar is made in the popular SG shape and is made out of poplar wood with mahagony veneer on top. The combination of these two woods gives this guitar a warm tone with pronouced middle frequency response, that are perfect for music genres I listed above. The neck is made from Okoume wood (alternative to mahogany) and is bolt on to body. This electric guitar has a stopbar tailpiece with Epiphones own LockTone bridge. The premium tunig pegs ensures that this guitar won’t go out of tune so easily. The fretboard has 22 medium frets. You can control volume with one master volume control and tone with one master tone control. Overall, a decent starting guitar for beginner players, especially for those who are into more heavier musical genres like rock and metal. Amazon customers have given this electric guitar 4.8 stars out of 5. Ibanez is a very prominent guitar manufacturer based in Japan and has been making electric and acoustic guitars for more than 5 decades now. The body has a similar shape to SG and is made from basswood (a wood that is often used by asian guitar makers and is similar to alder), while the neck is made from maple and has jatoba (also popular with asians guitar makers and similar to rosewood) fretboard. The combination of these woods gives you warm, well balanced tone with no particular emphasis on bass, mid or high frequencies. The neck is bolt on. Colors: Comes in colors - Baltic Blue Metallic, Candy Apple, Metallic Forest and Metallic Light Blue. This guitar is equiped with a stopbar tailpiece and and fulltone tune-o-matic bridge. Ibanez premium tuners makes sure you this guitar will stay in tune. The fretboard has 22 frets. Each pickup has its own master volume and tone controls. Overall, a very solid electric guitar from Ibanez that won’t leave you dissapointed. Especially worth looking into if you’re more into hard rock and metal. Amazon customers have given this guitar 4 stars out of 5. Recommended for: Country, Rock, Pop, Blues. Another electric guitar from Squier on this list, this time in telecaster shape. The body of this guitar has the legendary telecaster shape and is made from alder wood with a maple neck and fretboard. Alder beeing a lightweight wood gives this guitar a brighter sound that, lets say, mahogany and has more pronouced high midrange frequency response which in combination with maple neck gives this guitar a warm, balanced sound with brighter upper end frequencies. The neck is bolt-on. Comes in colors - arctic White, butterscotch Blonde, black, two tone sunburst, competition orange, race green, race red and slick silver. This guitar has a 6 saddle standard telecaster bridge and standard die-cast tuners, that stay in tune very well. The fretboard has 21 frets. Also has a master volume and tone controls. Overall, another superb guitar form Squier, that gives all the beginner player needs to master the guitar. Amazon customers have giben this electric guitar 4.2 out of 5 stars. As i mentioned in the beginning, after have made the purchase of your first electric guitar, you will need some accesories like cable, mediators and a strap and , most importantly, an amplifier. You might also want to change strings, as the strings that the guitar came with might be old and already served their time. If your don’t know how to do it, I suggest you taking the guitar to a guitar technician at your lockat guitar store. And while there you might also want to ask for a proper guitar setup, so there are no hitches in learning process. Good luck with your first electric guitar! squier deluxe strat, good price & bulid quality. next target, epiphone les paul 100. Well, I did start with an Epiphone Gibson Jr which later "evolved" (read: I traded in the Jr towards and bought) into a Gibson Special, and before that happened I got a red Yamaha. I don't know what type it is exactly, but it's not the one that you showed here (I don't think?). I've also got a Squire-P Bass. But yeah, from what I've heard those are usually some good beginner guitars. Those worried about price should see if there's more "basic" versions of these guitars (Like with the Eiphones; there's Jr, Special, Standard, etc). Also check out pawn shops! Some have a decent collection of guitars, and hopefully the people selling them know what they're talking about and have a good passion for guitars like the guys I go to do. Haven't steered me wrong yet. As the price factor is really important for a starter, I'll stick to the Epiphone Les Paul Standard since it is less than half the price of the second cheaper on the list. I learned on a '74 Gibson GB Standard 'cause I'm a rebel! But I agree with moi. Some of these guitars are a bit pricey considering that plenty of beginners are kids, and most kids aren't exactly swimming in money. If their parent is going to buy their guitar for them (which will probably happen), they will probably want to spend as little as possible, which means that the poor kid will learn on a first act guitar. That, or their parents/siblings hand-me-downs (I got the latter). Most of these guitars are beyond my budget, let alone a beginners.